Apologies for the quality of the print - included for rarity - historic interest. 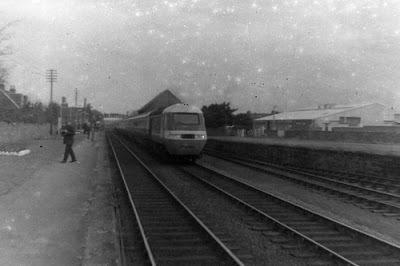 This was the first visit of an HST to Inverness for publicity purposes, in advance of these fine trains being introduced on Inter City services from Aberdeen to London.This is the train passing Nairn. The passing time was announced in the local paper - the Nairnshire Telegraph - and resulted in a decent crowd of spectators to witness the passing of the HST.